References XAP_Dialog::getApp(), ID_BUTTON_URL, XAP_App::openURL(), s_bEventLoopDone, and UT_DEBUGMSG. References ABOUT_HEIGHT, ABOUT_WIDTH, BUTTON_GAP, BUTTON_HEIGHT, BUTTON_WIDTH, UT_Win32LocaleString::c_str(), GR_Win32Image::convertFromBuffer(), COPYRIGHT_HEIGHT, DELETEP, XAP_Win32App::enableAllTopLevelWindows(), UT_Win32LocaleString::fromASCII(), UT_Win32LocaleString::fromUTF8(), g_pngSidebar, g_pngSidebar_sizeof, XAP_App::getApp(), XAP_Dialog::getApp(), GR_Graphics::getClassId(), XAP_Frame::getCurrentView(), XAP_Frame::getFrameImpl(), AV_View::getGraphics(), XAP_Win32App::getInstance(), XAP_App::getLastFocussedFrame(), XAP_App::getStringSet(), GR_Win32USPGraphics::getUSPVersion(), XAP_StringSet::getValue(), GPL_HEIGHT, HEADING_HEIGHT, ID_BUTTON_URL, UT_ByteBuf::ins(), m_pFrame, m_pGrImageSidebar, s_bEventLoopDone, s_dlgProc(), XAP_App::s_szBuild_Version, UT_CreateWindowEx(), UT_PNG_getDimensions(), UT_RegisterClassEx(), UT_UTF8String_sprintf(), UT_UTF8String::utf8_str(), VERSION_HEIGHT, XAP_ABOUT_COPYRIGHT, and XAP_ABOUT_GPL_LONG. References _onCommand(), GR_Win32Graphics::drawImage(), XAP_App::getApp(), GR_Image::getDisplayHeight(), GR_Image::getDisplayWidth(), m_pGrImageSidebar, XAP_App::newGraphics(), s_bEventLoopDone, UT_DefWindowProc(), and UT_return_val_if_fail. 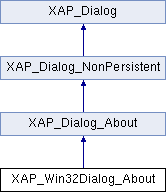 Referenced by runModal(), s_dlgProc(), XAP_Win32Dialog_About(), and ~XAP_Win32Dialog_About(). Referenced by _onCommand(), runModal(), and s_dlgProc().